I think that it is necessary and sufficient product. Although it feels loose from the product error or somewhat other things, I feel that there is no problem because the feel is different also by the nut. This review is about item#48920261. The number of bikes using hexagon bolt has increased. 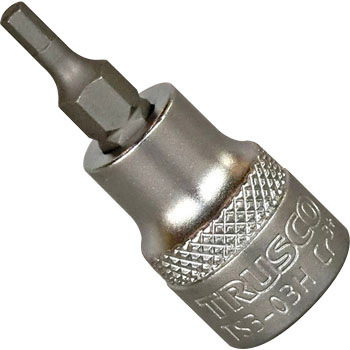 A good thing, the problem is when the rusted hexagon bolt is hard and does not turn. In L-shaped hexagon wrench, teeth are often inconspicuous. It is the turn of that time. There were times when I had a turn, but I am not dissatisfied so far. This price is enough for the quality of plating and the accuracy. This review is about item#48920243. Because we can not purchase much at mass retailers, we always take care of Mr. Monotaro, so please keep handling items that are not so much in mass merchandisers in future. I think that goods can be used. This review is about item#48920234. This review is about item#48920252. I bought it for bike maintenance. I used it in a place where torque is not applied too much such as cowl, but it seems to be able to use it so hard as well. TRUSCO products have a sense of security as a domestic manufacturer. It is not necessary for me to be expensive. The price is affordable, quality is no problem. This review is about item#48920277. I do not get rattled well. Low price It is satisfactory. I tried to loosen the set bolt of the sprocket and broke quickly. Even if it is cheap, it is not necessary if it is a tool that can not be used once. Since the thing which I used until now twisted, I purchased it. I bought 4 · 5, but I am relieved because the steps are stuck and the base is thin. Because I think that the socket type is a consumable item to some extent, it is attractive also because it is cheap. It is doubt why it can be supplied at this price. If you have a long type, I would like to purchase that too. Even if a glasses wrench or the like was substituted for a normal hexagonal wrench instead of an extended stay, it could smoothly loosen the fixed bolt which was not loosened at all. Despite being inexpensive, seems to have a decent grill that can withstand practical use. In a hexagonal wrench, when the force is considerably necessary to remove the bolt, purchase to remove it with a socket wrench or the like. If you put power in a hexagonal wrench, since it is close to the thing to be removed, it is easy to hit a hand or the like by sliding, but if you use this, you can use it lightly and you can safely remove it. The price is also reasonably reasonable and aligned with items of size 9, 5, 8, 10, 12 mm at insertion angle, it looks beautiful and satisfactory. Durability is now. I am not expecting so much because it is cheap, but there is nothing wrong with occasional use. I do not know the durability yet. I am impressed that very basic performance is provided for very reasonable prices. It became practical practical use sufficiently. This review is about item#48920225. There is little backlash on cheap, the tip is chamfered and easy to use, texture is good enough. I can not see it as a tool of a hundred yen range. It is enough for work which does not require torque. I do not know the strength when large torque is required. This review is about item#48920286.